Monday 18 March: Bank Holiday in both Northern Ireland and Republic of Ireland. Monday 18 March: NIFHS Research Centre C4 and its resources, with Kathleen Morrison. Host: NIFHS, Larne branch. Venue: Larne Bowling & Lawn Tennis Club, 112-120 Glenarm Road, Larne, BT40 1DZ. 7:30pm. Free. All welcome. 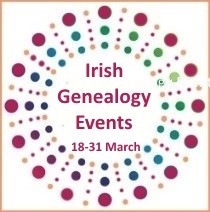 Monday 18 March: Irish Genealogy Workshop, with the Ulster Historical Foundation. Hosts: Heinz History Center and the Westmoreland County Historical Society. Venue: Senator John Heinz History Center, 1212 Smallman St., Pittsburgh, PA 15222 USA. 9am-4:30pm. Fee. Details. Tuesday 19 March: Irish and Scots-Irish Family History Research Workshop, with Ulster Historical Foundation. Host and Venue: The Filson Historical Society, 1310 S. 3rd St., Louisville, KY 40208,USA. 9am–1pm. Free to members. $20 to non-members. Details. Tuesday 19 March: Childhood and youth in Ireland from 1740, with Dr Sarah Anne Buckley. Host: Tipperary People and Places Lecture Series. Venue: Tipperary Studies, The Source, Cathedral Street, Thurles, Co Tipperary. 7:30pm. Free. Tea served. All welcome. Wednesday 20 March: Wreck and rescue in Dundrum Bay in the 19th century, with Barbara Lomas. Part of PRONI's Wreck and Rescue lecture series. Host and venue: PRONI, Titanic Boulevard, Belfast. 1pm. Free. All welcome. Need to book. Details. Wednesday 20 March: 'This is supposed to be a civilised country and part of Great Britain!' Southern Irish loyalists and revolution, with Brian Hughes Part of the Social History and the Irish Revolution public lecture series. Hosts: Glasnevin Museum and Trinity College Dublin's School of History & Humanities. Venue: Milestone Gallery, Glasnevin Cemetery Museum, Finglas Road, Glasnevin, Dublin 11. 7pm to 8:30pm. Tickets should be booked in advance. €6. Wednesday 20 March: Irish & Scots-Irish Research Seminar. Host: Family Hunger, PLLC and Jan Clizer—Painting Scotland. Venue: Lake City Center, Coeur d'Alene, Idaho. 1pm–8:30pm. Fee. Details. Wednesday 20 March: Exploring a townland history in an urban setting, with Roddy Hegarty. Host: Host: North of Ireland Family History Society, North Armagh Branch. Venue: Venue: Bleary Community Centre, 1 Deans Road, Bleary, Craigavon, Co Armagh, BT66 7AS. Free. 7:30pm. All welcome. Wednesday 20 March: Cathal Brugha and the Ring / Dungarvan Connection, with Nioclás ó Griofán. Host and venue: Waterford County Museum, St. Augustine Street, Dungarvan, Co. Waterford. 3pm. Free. All welcome. Wednesday 20 March: Eviction in Westmeath during the Irish Famine, with Dr Ciaran Reilly. Host: Westmeath Historical Society. Venue: Greville Arms, Pearse St, Commons, Mullingar, Co Westmeath. 8pm. All welcome. Thursday 21 March: The European Dimension: Dublin in the 11th century, with Dr Dagmar Ó Riain-Raedel. Host: Royal Society of Antiquities of Ireland, Venue: Helen Roe Theatre, Society House, 63 Merrion Square, Dublin 2. 7:30pm. Free. All welcome. Thursday 21 March: Soft power: the women of Tyrone's Rebellion, with Dr James O'Neill. Host: Ulster Society for Irish Historical Studies. Venue: PRONI, Titanic Boulevard, Belfast. 7pm–8:30pm. Free. All welcome. Details. Thursday 21 to Saturday 23 March: Dominus Hibernie/Rex Hiberniae: Pre-modern Ireland, 1200-1801, an international symposium. Host and venue: The National Archives in Kew, London. Need to register. Details. Friday 22 March: Researching Your Irish and Scots-Irish Ancestors, with the Ulster Historical Foundation. Host: Valparaiso County Library, 103 Jefferson Street, Valparaiso, Indiana, USA. 9am–4pm. Free. Details. Saturday 23 March: Irish Genealogy Seminar, with Ulster Historical Foundation. Hosts: Florida Genealogical Society, Pinellas Genealogical Society, Genealogical Society of Sarasota, Manatee Genealogical Society, The Villages Genealogical Society, Lakewood Ranch Genealogy Club. Venue: Robert W. Saunders, Sr. Public Library, 1505 Nebraska Ave., Tampa, Florida USA. 8:30am–4pm. Fee. Details. Sold Out. Sunday 24 March: Irish Genealogy Seminar/Workshop, with Ulster Historical Foundation. Host and venue: Gaelic American Club, Fairfield, Connecticut, USA. 9am–4:30pm. Fee. Details. Sunday 24 March: Sacred stones and the cult of sun worship, an open-air talk with William O’Brien. Host: West Cork Stone Symposium 2019. Venue: Ballycommane House & Garden, Ballycommane, Durrus, Co Cork. Talk followed by tea & coffee and a chance to explore the B&B’s beautiful gardens. 3pm. €10; €8 concessions. Details. Monday 25 March: NLI Reading Room and Manuscript Room closed all day to facilitate the Library's continuing redevelopment of the premises. Venue: National Library of Ireland, Kildare Street, Dublin 2. All other services/exhibitons/cafe, including Genealogy Advisory Service, operate as normal.